Thermistor Thermometers We can provide precise accurate thermometers using thermistor temperature probes. Thermometers available from 1� to 0.0001� resolution. Also available are remote data acquisition modules. 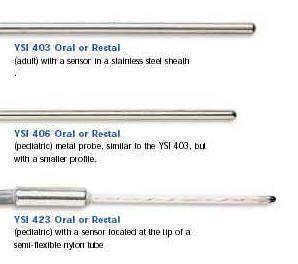 Series 400 Industrial and Medical Probes These probes are the standard or the industry. Pictures, specifications and pricing are shown here. Configure to Order Industrial Probes These probes are available for specialty applications. Minimum order is $ 750.00. For many probes we have alternate suppliers and in-house capability for smaller quantities. YSI 400 probes above are available from stock. Thermistors We stock thermistors in many values and configurations. Please contact us with your requirements and we will do our best to fill them from our vast inventory. Thermistors provide highly accurate and stable temperature sensing for measurement, compensation, and control. Tight interchangeability of our precision components allows precise measurement without calibration of circuitry to match individual components. Thermistor Tables and Equations and Applications Notes Thermistor tables and temperature Applications notes.